Last year, I dared to walk the length of the TL to arrive at my eating destination of Brenda's French Soul Food. Was it worth it? To risk life and limb (and my camera) by strolling through one of the roughest parts of town? Turns out to be yes. It was worth it. Not only does Brenda's serve up something a bit different for Breakfast, it doesn't hurt the wallet either. Fast forward to 2010 and once again I took the scenic route on my way to try some Banh Mi at Saigon Sandwich. You'd think that I was done with the TL for the time being; but oh no, not a chance. In search of breakfast, Kim and I wanted to see if we could get into Dottie's this time around. Goo d luck there. Nope, an hour wait. Forget about it, we gave up. Off to find other eats. Well, that was easier said than done. 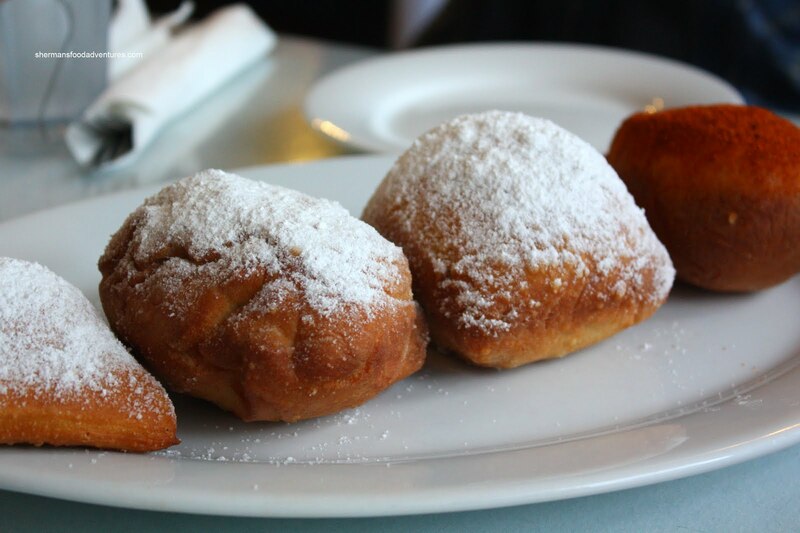 In a sea of diners in the Downtown core, they seem to serve the same safe things over and over again. Bacon and eggs is all we saw. We didn't come all the way to San Francisco for that. Consequently, I suggested we head to Brenda's French Soul Food. It was nearby and honestly, I already knew the food would be good. Safe bet. To our utter surprise, there was no lineup. Last time, I was lucky to score a single seat. This time we not only got a table, we got one with decent lighting. It's really too bad TS/JS couldn't join us! LOL. They didn't wake up in time. Those lazy asses! 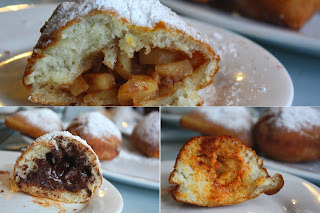 Unlike the last time, where I dined alone, we could order the Beignet Flight which consisted of all 4 beignets - Crayfish, Apple, Chocolate and Plain. For some reason or another we started with the "best" one in the Crayfish with scallions, cheddar and cayenne. This time, the beignets were softer; but the crayfish filling was still the same, which is a good thing. Savoury and slightly sweet, oozing out cheese with a nice kick from the cayenne, words cannot describe this tasty treat. I was not as enthused with the Ghiradelli Chocolate. Possibly because I am not a dessert person or the fact there was just too much chocolate. Quite heavy as a result. The Granny Smith Apple with cinnamon honey butter was quite good. Reminded me of a fried apple pie. 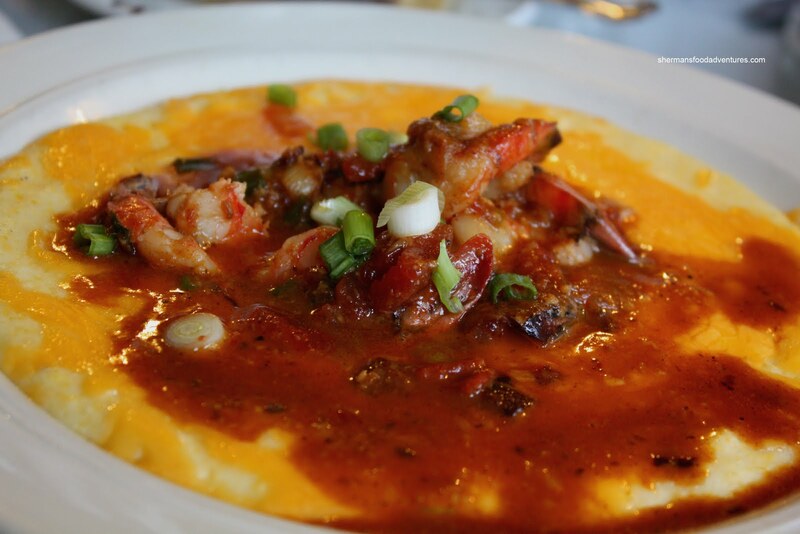 For my main, I went for a classic Southern dish in the Shrimp & Grits. Compared to the one I had at the Screen Door in Portland, this version was much more savoury and rich. 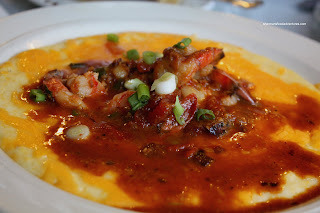 Lots of grits with melted cheddar, nicely cooked shrimp with a mildly spicy bacon tomato relish. Truly satisfying. Kim had another of their daily specials with the Crayfish & Andouille Pot Pie. 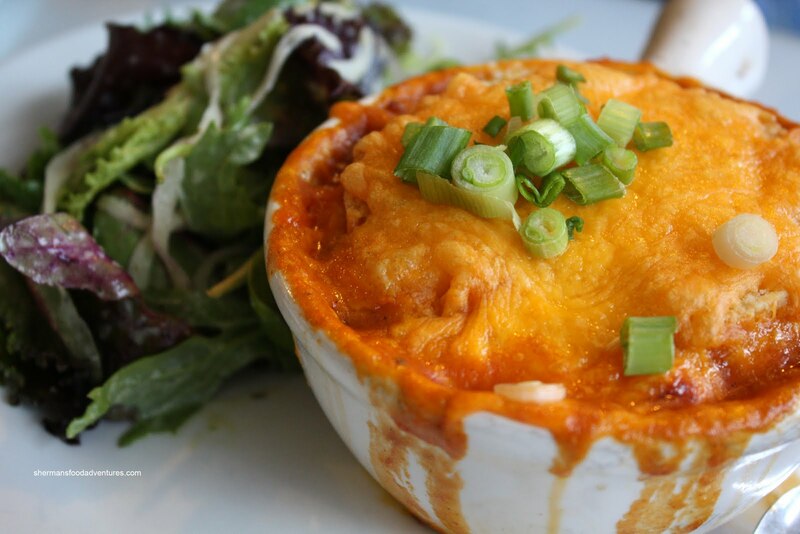 Hidden beneath the baked cheddar topped biscuit lay nuggets of crayfish and andouille in a savoury spicy roux. Another hearty and heart-stopping dish. Really bold flavours. I was really happy to return to a familiar place where the food is good and the prices are reasonable. It doesn't hurt that it is something out of the ordinary, if not a bit challenging to ones' cholesterol. Sorry man, if the area is the "worst" of the TL, man, it will certainly confirm what we discussed about you being "born tender", hahahaha! Thanks for the suggestion, as it certainly hit the mark that day, hehehe. Yes, I am indeed tender. Probably filet tender. Yah, that is what happened last year. All I ate, I think I lost weight. So much walking and the hills!